Revolution President Eric Menzer and Manager Mark Mason presented Stephen Penney with this plaque prior to the game on September 2, honoring him as Community Outreach Player of the Year for 2015. 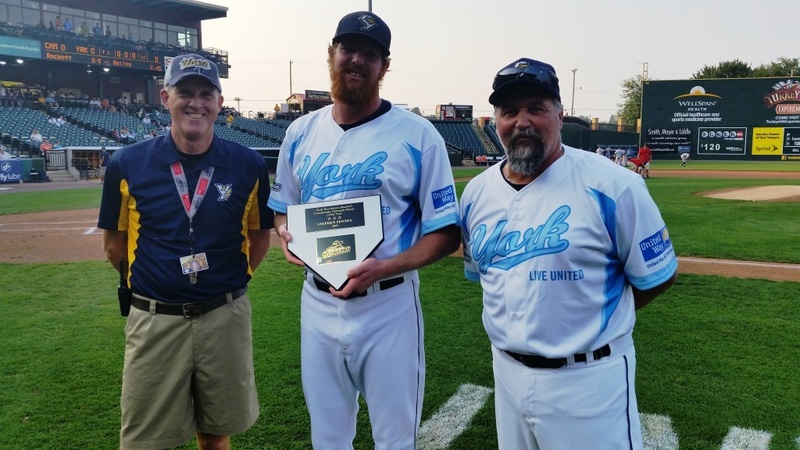 In conjunction with United Way Campaign Kick-Off Night at Santander Stadium on September 2, right-handed reliever Stephen Penney was presented with the York Revolution 2015 Community Outreach Player of the Year award prior to the game. The Revs wore special “Live United” jerseys pictured above, and a silent auction of the game-worn uniforms from the 9-2 win over Camden benefited the United Way. 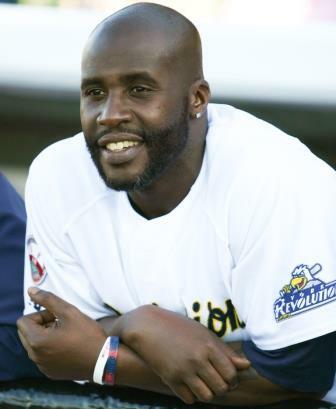 Each season, the organization selects one player who goes above and beyond his player contract, to help ensure the York Revolution remain the most family-friendly outlet in the area. The award goes to a player that has a true understanding of the role a minor league baseball franchise plays in its community. 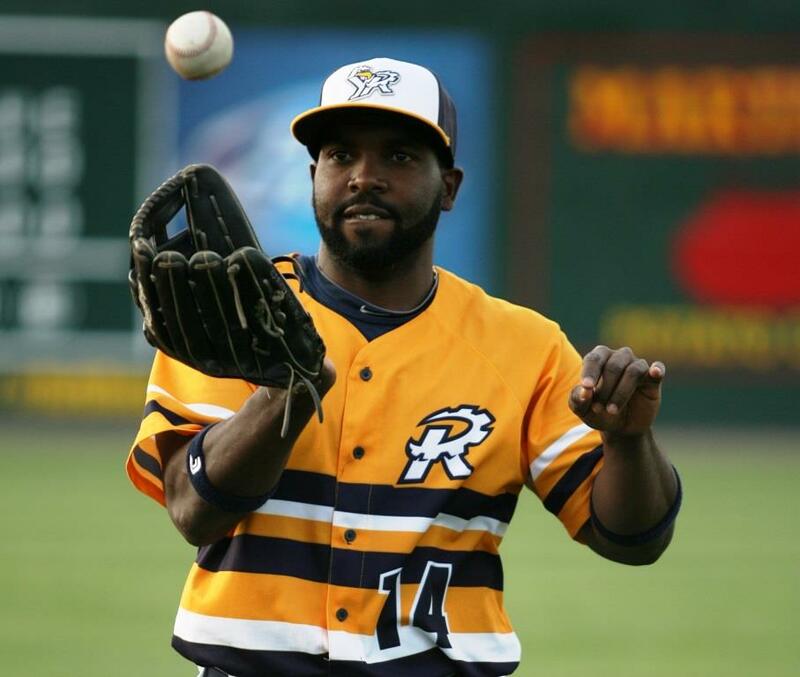 The York Revolution has announced the release of outfielder/first baseman Johan Limonta, who played in parts of four seasons with the Revs. He was batting just .209 in 43 games this season for York, with four home runs and 11 RBI. Unfortunately, it’s the second time this season one of the most accomplished and popular players in Revolution history was released. It’s yet another demonstration however that Manager Mark Mason is serious about re-tooling his roster to make a run at a second half division title, as one of the worst halves in Revolution history comes to a close. The clubhouse is certainly getting younger as some respected veterans have been involved in some tough decisions of late. As was the case with Corey Thurman’s release, it’s strictly based on numbers, as like Thurman, Limonta was certainly beloved by fans and respected greatly by his teammates. It’s surprising when you look back on it, but Limonta never played a full season with York, despite donning a Revs uniform in every season since 2012. He joined the Revolution for the final 39 games and playoffs that season after beginning the year at Triple-A Tacoma in the Mariners system and after a stint with Mexico City in the Mexican League. In 2013 Limonta began the season in York, staying just 16 games before his contract was purchased by the Padres, where he finished the season playing in 73 games for Double-A San Antonio. Coincidentally, Limonta hit the first Revolution home run in 2013, and the last homer of San Antonio’s season, a grand slam which wound up as the winning hit in Game 5 of the Texas League Championship Series, delivering San Antonio the title. Stephen Penney has made many, many more relief appearances for the Revolution than what he’s indicating here. And he’s now the all-time franchise leader in games pitched for starters or relievers. 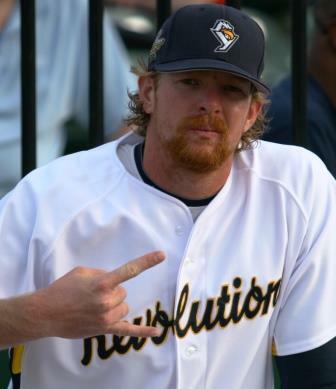 When Stephen Penney pitched the eighth inning of an 8-7, 13-inning loss to Sugar Land at home on June 6, it was his 182nd regular season appearance with the York Revolution, in his fourth season with the club. That number is the most by a pitcher in franchise history, as Penney passes Corey Thurman who made 180 starts and one relief appearance. Penney, 28, who as of June 6 sported a miniscule 1.05 ERA in 18 games and 17 innings this season, has just a 2.81 career ERA in 173.2 innings pitched with York since 2012. His strikeout to walk ratio during his Revolution career is nearly 4:1 (319 K, 84 BB). It’s a rather amazing statistic, but exactly a quarter of the way through their ninth season as a franchise, the York Revolution have finally played in the 15th inning, after a 4-3 victory at Long Island on May 31. It’s an anomaly to make it through a single season without one game that long, let alone eight full seasons. 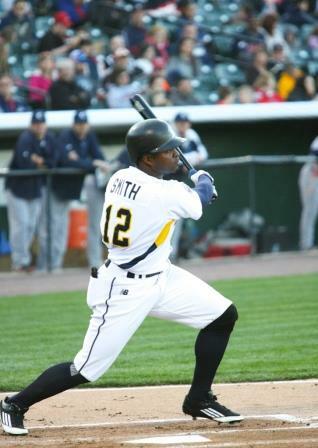 Adding to the intrigue was Sean Smith’s solo home run to put York ahead in the top of the 15th, which is no big deal except for the fact it was his first homer since…this one in last year’s postseason and the grueling rehab that came after it. Josh Judy then entered for a tidy three up, three down 15th for the save, his seventh in as many opportunities. The Revs used eight pitchers in the game, one short of tying a team record. The Revolution had played 14-inning games five times previously (all losses), four of which were on the road. The longest game innings-wise in Santander Stadium history remains a 7-4 loss to Somerset on May 6, 2013. The 5/31 win over Long Island lasted four hours and 35 minutes, making it just the sixth-longest time-wise in franchise history. That honor still belongs to the four hour, 57 minute, 14-inning marathon at Bridgeport on August 3, 2010, a 6-5 Revolution loss. When it comes to the ebb and flow of a long baseball season, this might be the most ebby and flowy first 17 games the Revolution have had in their history. Just days after completing the first ever road sweep of Lancaster, a 5-1 loss to Southern Maryland on May 11 marked the first time York has been swept at home in a four-game series in their nine seasons. It’s pretty remarkable it took this long, not that that would come as any consolation at the moment. It is a familiar feeling of despair with the Blue Crabs involved however; despite the names changing over the years, facing that club has usually not yielded positive results for the Revolution.